Forward this email to your husband, partner or child right away. O.K., Kenya and Chloe don't have email -- most 5 and 3 year-olds (thankfully) don't -- but you get my drift. You want this Strawberry Parfaits recipe in the hands of the people you love. You can leave them notes on their pillows, mention it in casual conversation at the dinner table, write a song about it or, just come right out and fess up to the fact that this is what you really want to have on Mother's Day morning -- something fresh, simple, healthy and tasty…which is also a recipe everyone can make together. And, it couldn't be easier, so there should be no excuse from your peanut gallery that they can't figure it out! If they have the ability to get to the market, take a glass out of the cupboard and layer juicy strawberries, tangy Greek yogurt and crunchy granola, then they can put this spectacular dish together. And if they forget it for breakfast, no worries. Just make sure it ends up being delivered to you in the afternoon (on a tray as you're lounging on the couch reading a good book) or maybe after dinner while they're all doing the dishes and you're chilling out on the side lines! Doesn't that just sound lovely, moms? Well, a girl can always dream. 1. 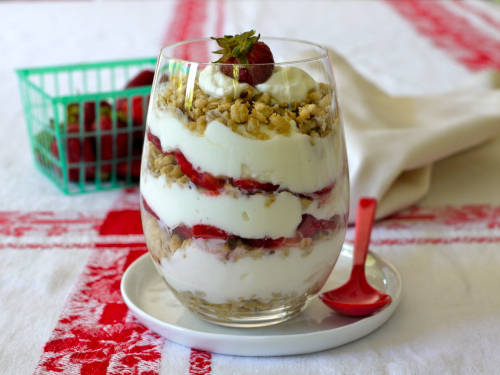 In your prettiest glass or serving bowl, layer granola, Greek yogurt, A drizzle of honey, and the sliced strawberries. Repeat in that order until you fill your glass or serving bowl, finishing it with a dollop of Greek yogurt, another drizzle of honey, and a small whole strawberry on top. So my amazing husband made this for me for mother's day breakfast and it was absolutely delicious! Such a simple thing but so beautiful and so yummy! I actually ended up making us each one this morning for breakfast as well. Thanks so much! Awesome strawberry parfaits!! Send us the recipe please! My girlfriends and I are always looking for new blogs. Your blog is wonderful. I'm a huge fan of \"Cooking With Mr. C.\" and \"Food 52\". I will share your blog with my friends. We love to follow many blogs.